This is the story of how the atom bomb was developed--with allowances for dramatic effect and national security of course. A triumph of science which led to unfathomable destruction. MGM faced a delicate task in telling this story. As expected, it contains a heavy dose of propaganda, but the tale is still told with a conscience. 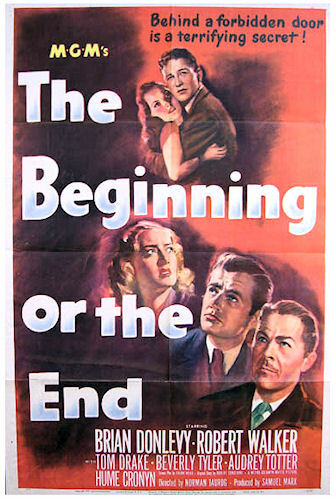 Now available on DVD from Warner Archive, The Beginning or the End (1947) is a harrowing experience, but also provides an interesting insight into post wartime attitudes in the United States. Framed as a sort of warning for citizens of the 25th century, The Beginning or the End acknowledges from the start that creating a weapon as powerful as the atom bomb could lead to world annihilation. 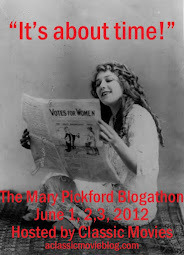 But nevertheless, the overriding message of the movie is that it had to be done. Either unleash the destruction, or struggle through another year of war. And after all, they dropped leaflets warning the citizens of Japan ahead of time. Surely that saved enough lives? As confident as the film can be about the decision to bomb Hiroshima, there's always a haze of guilt present. A great cast helps to humanize the deadly process. Brian Donlevy is General Leslie Groves, who was in charge of the Manhattan Project, while Robert Walker is Jeff Nixon a colonel who guides physicist Matt Cochran (Tom Drake) through his first military project. Hume Cronyn adds the small amount of humor the movie can bear as the eccentric Dr. J. Robert Oppenheimer another key physicist on the project. Audrey Totter has a much too small role as secretary and girlfriend to Nixon, but it's always interesting to see her play a good-hearted character. Cochran is the heart and conscience of the film. He is the most hesitant key player on the project. When several pacifist workers quit upon learning they are building a weapon, he is ready to bow out as well, and must be convinced to continue. He is newly married and in his tender interactions with his wife (Beverly Tyeler) simultaneously symbolizes what he is fighting for and what he is about to destroy. An entire town was constructed to support the building of the atomic bomb. Hundreds of workers and their families worked for three years on the project. Most of them didn't know what they were building. Those with higher security clearance were not only more aware of the gravity of the task, but in more danger from radiation either throughout the construction process or in the aftermath of testing the weapon. This daily danger is demonstrated in a chilling early scene where Cochran sets off a Geiger counter as he passes the security gate after work and is temporarily thought to be contaminated. It's scary and sad to watch these men soberly build something that will kill so many. Maybe the ultimate goal is peace, but the method is still death and destruction. Those workers who know what they are building take some joy in little victories throughout the process, but there is no real happiness in this task. The scene where the bomb is tested is staged like the best of thrillers. It is tense and absorbing, but you can't help but be reminded that a successful test will mean widespread death. This includes the many men who were exposed to radiation while observing the test. While scientists were aware of the dangers present in making and testing the bomb, no one was yet aware of the extent of the damage it could cause. It is hard to believe that after all the effort and resources that went into the building of the bomb, it took one plane, and one brief moment of deployment to unleash so much destruction. There is no rejoicing among the men when the world below is suddenly engulfed in flames. They just want to be done with it, though they seem to know they'll never be able to forget. Ultimately, there is nothing to celebrate here and the film is wise to the horror of it all. Though it's too disturbing to be very enjoyable, The Beginning or the End is a tense, well-acted, fascinating document of its times.